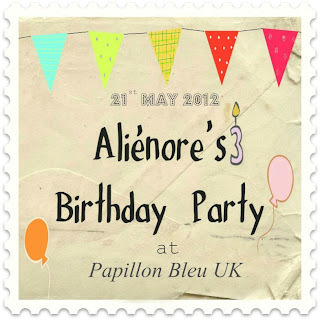 Papillon Bleu UK: Birthday Party Invitation and...a GIVEAWAY! Birthday Party Invitation and...a GIVEAWAY! There will be a prize to win on this occasion! 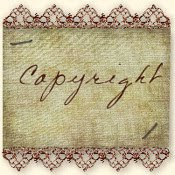 If you wish to join in, it is simple, just leave a comment here, share the invitation and link on your blog. I will then add you to our guest list. The Giveaway will be a Papillon Bleu UK doll ! YAY!!! I will draw the winner via a random genarator. For the party, feel free to do anything to wish: a poem, a video, a song, a drawing...ANYTHING! If you wish to see the previous events, you can see our beautiful portrait competition here, lovely drawings here or the lovely video of her first birthday...it was so much fun! 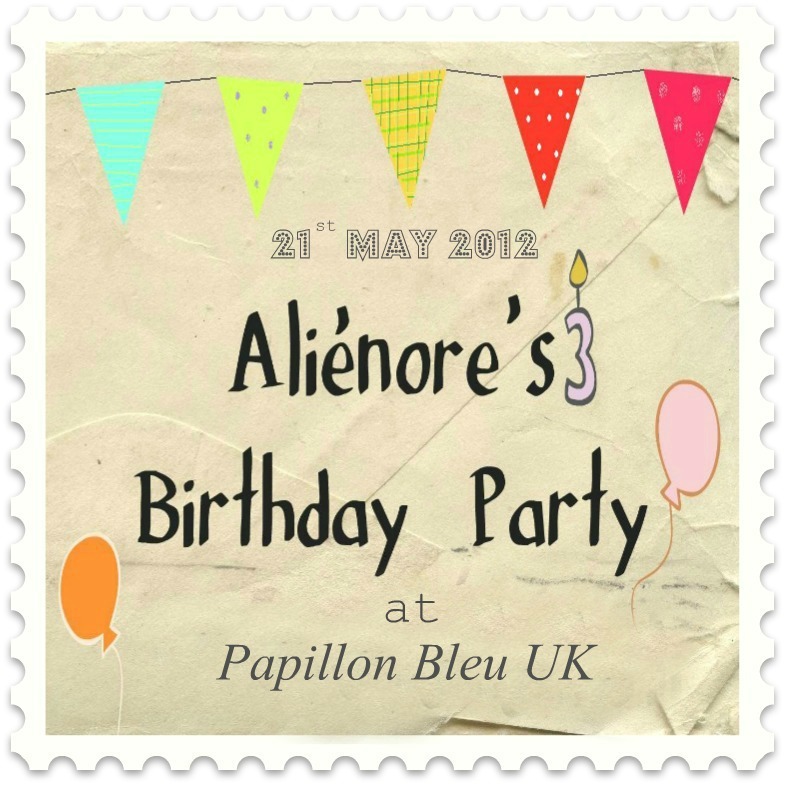 PS: if you don't have a blog but are on facebook, feel free to leave a message on Aliénore's page HERE. PS2: Here is a button you can use to link to the blog here. i won't miss the party for anything!!!! i adore alienore!!!! Yes, I want to play! I don't know what I'll do yet, though. I have until May 21st? 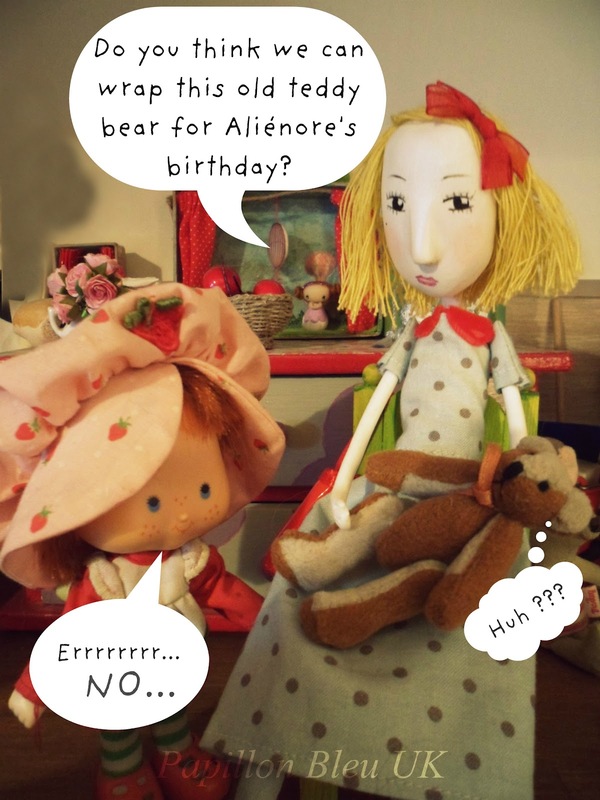 I come to your birthday with pleasure Aliènore ! Je lancerai des invitations sur mon blog, demain mardi ! A bientôt ! I'm so happy to go to your birthday party !!! moi aussi ,moi aussi !! 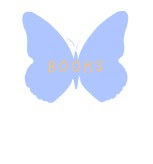 !j'ai fait un post livre et anniv sur ma blog! Quelle idee! looking forward to it! I just love Alienore! Please sign me up! 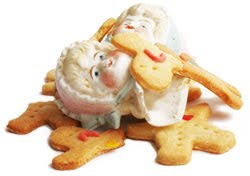 Hugs to you and all of the dollies! Voilà une fête d'anniversaire qu'il ne faut pas manquer! Je vais le dire à Nina et Lucie et voir si elles ont des idées pour préparer quelque chose pour Aliénore. Tout cela est bien excitant. 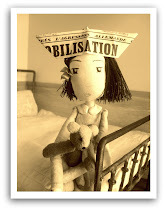 Je vais mettre un lien sur mon blog. How nice a party!! Thank you for the invite. Oh dear I have to go and see what I am going to wear for the party as I have nothing to wear! Oh, this looks like such fun. Yes please! I want to come to the birthday party, too! 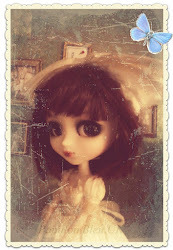 I'm putting the invitation up on my doll blog RIGHT NOW! This is one of the sweetest spots online, and so full of charm and whimsy. Thank you of r your invitation. And I will see what this possum may produce for the occasion. I will be updating the list asap! have managed to publish the comments but am away from home and am currently on somebody else's laptop. I am glad you can all make it! May 21st is my son and god daughter's birthday too...special people are born on that day. :) I'm going to join the fun! I will be there, please count me in!! i would love to come to the party! OH!!! Can we come too, pretty please?? We have not been to a party in ever so long.... what a delightment!! I would love to be invited to the party? Do I need an invitation? I tried leaving a comment on your latest post and it did seem to accept it. Just let me know! I also posted the party link on my blog and it linked back to your party but said 'sorry, no blog post is posted for this link.' But it did link back to you. Maybe you have to 'allow' it to link back to my blog. I will await patiently, for your reply! Oh, what a nice invitation. I'm happy for the birthday celebration. Thank you very much, I'm happy and bring a bouquet of good wishes. 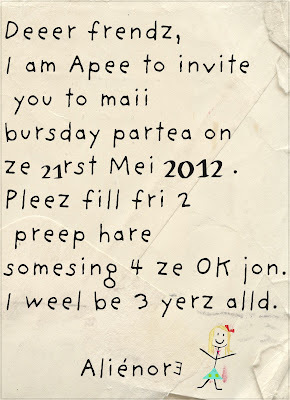 Thanks alot sharing birthday invitation. Hope so it will be rocking birthday party . Cards is more important to intimate other. letterhead printing and cheap postcards . Excellent thanks appointment cards . UN JOYEUX ANNIVERSAIRE À CETTE POUPÉE EXTRAORDINAIRE! Oh darn I think I missed the party! And with my b'day being May 2oth, and my brother's May 22nd! Have a happy!